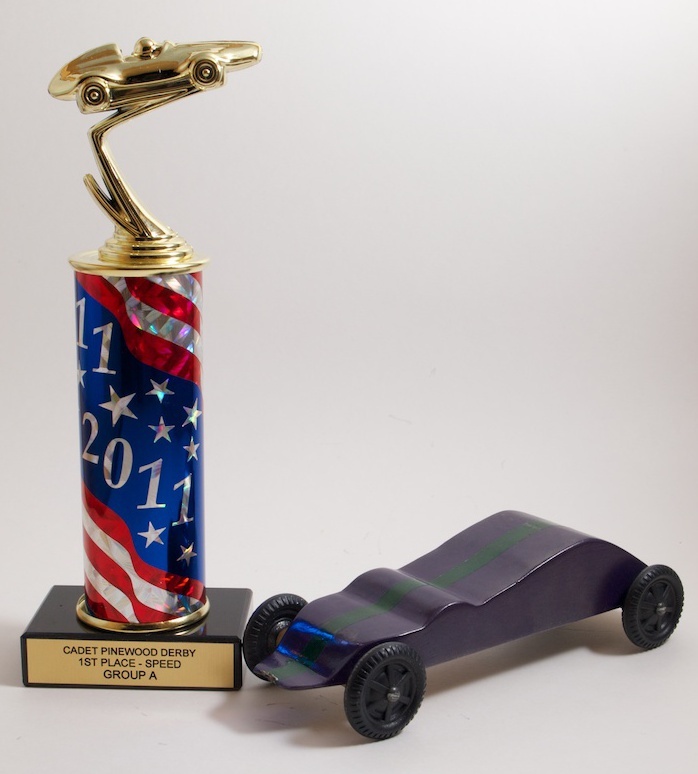 Well, SoCal Pinewood Derby has come and gone. #2’s car took 1st place in Group A (1st/2nd grade)! As promised, here is a picture of all of our cars (click to enlarge). Speaking of, these amazing photos were taken by Kazooless with this technique — any serious photographer will want to try it out! You can reach two slideshows of Kazooless’ pictures from the derby, as well as links for downloading full-res originals, from the Council webpage. High drama at Pinewood Derby last night! First off, in the Turkey finals, we had to have a race-off between two cadets who had always won (slowest) in each of their heats, except heats in which they were together, which they split 1-1. So we put those two down the middle two tracks, and one car was clearly slower (Turkier). Then we swapped lanes, and the other car was clearly slower (not all lanes of our track drive the same) — BUT, so much slower that this time he didn’t make it to the finish line, thus making that run a DQ and deciding the winner. Heat 1, points-leader first, #1 second. Heat 3, #1 first, points-leader second! Heat 4, points-leader derails for fourth! #1 gets first and snatches the trophy! #2 made a pretty fast car too, he was just out of the finals, tied for 5th in the sweet-16. We’re hoping for a trophy in the all-council derby, where he will be competing only against 1st/2nd graders. That’s coming up Sat Mar 26, 12-4, hosted at our church. If you’re in San Diego, come on out, have lunch at our snack bar, and enjoy the races — it’ll be a blast!